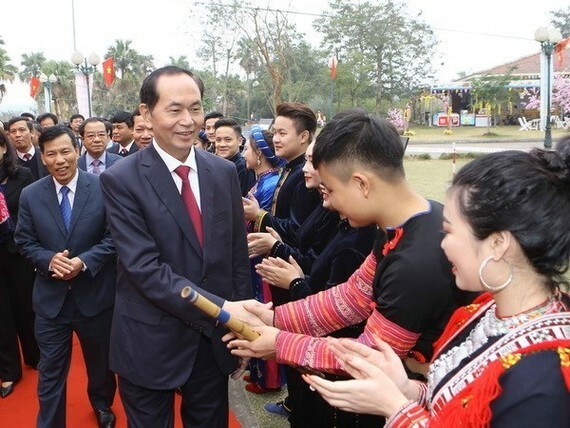 President Tran Dai Quang beat a gong to launch the annual spring festival at the Culture-Tourism Village of Vietnamese Ethnic Groups in Hanoi’s outlying district of Son Tay on February 24 (the ninth day of the Lunar New Year). Attending the event were 200 delegates who are village patriarchs and chiefs, intellectuals and artisans representing 21 ethnic groups from 14 cities and provinces nationwide. In his speech, the President lauded the Ministry of Culture, Sports and Tourism; the management board of the village and ethnic groups living in the village for contributing to the preservation and development of the traditional Vietnamese culture, saying that the festival has attracted tens of thousands of visitors over the past years. He wished that village chiefs, artisans, religious dignitaries and prestigious people representing ethnic groups and localities would actively work to raise public awareness of the Party and State policies and guidelines to contribute to national development. The State leader asked ministries, agencies and mass organisations from the central to grassroots level to assist ethnic groups in socio-economic development, education, culture and health care. On the occasion, he planted a tree in Muong ethnic village and launched the Gau Tao festival of the Mong ethnic group in the northern mountainous province of Ha Giang. Gau Tao, held to thank gods for granting good health to families and villages, is one of the largest traditional festivals of Mong ethnic people. It combines almost all types of folk cultural activities of the group and has been recognised as part of the national intangible cultural heritage by the Ministry of Culture, Sports and Tourism. The spring festival at the ethnic cultural village will feature a wide range of activities, spotlighting the traditions, customs and spring festivals of 54 ethnic groups across the country. Another major activity will be a praying ceremony where monks from Khmer pagodas will pray for peace and blessing.